Fargesia nitida Jiuzhaigou bamboo originated through collection from Jiuzhaigou Park, Northern Sichuan, and a national park in China since 1982 with an elevation range between 6,500 ft. to 15,000 ft. Within one clump you will be able to watch the plant change throughout the seasons, and even display differences in dull or sunny weather. 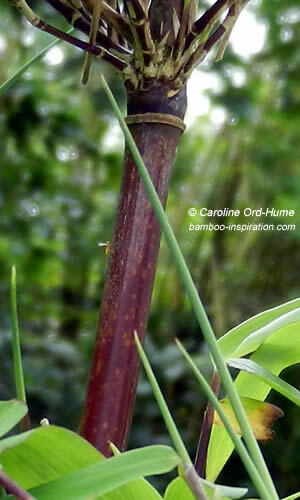 The small leaves do not weigh the top of the plant down and therefore an open upright habit is maintained that will be a characteristic of this bamboo. The following detail is mainly focussed on Fargesia sp. Jiuzhaigou 1 (I), red caned bamboo, but other forms you can buy are mentioned with brief descriptions. Jiuzhaigou 1 is one of my favourites with the variety of colour in culms, from the dark new shoots, to the red they are recognised for, right through to various shades of orange and brown as the plant matures. Fargesia sp. Jiuzhaigou has a loose clumping pachymorph rhizome and root system growing habit with the average clump size over a ten year period reaching up to 1 metre (3.3 ft.). 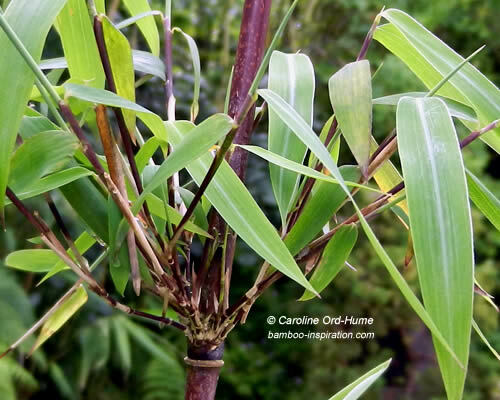 It is a tidy size bamboo plant that's large enough to make an impact but being a clumping species it will not take over your garden if planted out. The characteristics of Jiuzhaigou 1 also make it ideal for pots and containers as do other Fargesia. Maximum height: Somewhere between 2 and 4 metres (7 to 13 ft.) can be expected and although unlikely to reach full height in pots an average of 3 metres is usual (10 ft.). This species has slender culms that should reach a maximum diameter of up to 1.5 cm (0.6 inches) on maturity. However, they may not have been in cultivation long enough yet to determine the certainty of culm width on a mature plant so treat this assessment as a guide. New shoots grow upward with an initial colour of fresh dark green emerging out of really dark purple sheaths that look almost black sometimes. The contrast between the dark sheath and bright green new culm of Fargesia nitida Jiuzhaigou 1 is really attractive. On a new culm the sheath starts with dark colouring but changes to a dusky purple followed by shades of brown as the sheath ages. 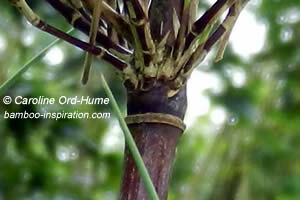 Although the sheaths tend to be retained, are persistent, they do add to the aesthetics of the culms. Sheaths can be removed manually if preferred but be careful not to damage the plant. Narrow straight and tidy culms that don't seem to deviate from growing straight up! Although new culms are dark green, they soon change to a red colour that can appear like a red-brown, or red-purple, followed by another change to more of a yellow orange tinge. The depth of colour is affected by degrees of shade and sunlight. The characteristic Jiuzhaigou red canes also provide an assortment of other colours displayed through different seasons and ages of the culms. 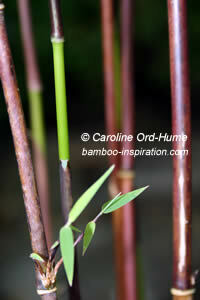 Don't surround this bamboo with other plants that will obscure the beautiful culms. The thin branches grow in groups around the nodes. Small and delicate, attractive displays of tiny green leaves hanging from bunches of Fargesia nitida Jiuzhaigou branches . Hardy to a minimum temperature of -25°C (-13°F), zone 5. Not suitable for climates with intense heat. Although it is sometimes suggested that Jiuzhaigou can be planted out where it gets a lot of sun, the majority of bamboos prefer some light shade and do not actually fare well in full sun all day. 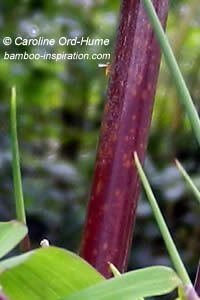 Sunlight can play a part in the deepening red of culms, sometimes producing a more vivid red bamboo culm in Jiuzhaigou 1, but full sun can also cause damage to leaves so it all depends on your climate and/or exactly how much of the midday sun your Fargesia nitida will get. I recommend 2 to 4 hours of morning sun to get best red canes but a bit of light or dappled shade in the middle of the day to prevent fading culms and leaf curl, although it is said that when the shade returns the leaves will uncurl again. You will have to make the judgement according to where you would like to plant it and the strength of the sun in your location. A spacing rate of around 2m (6.6 ft.) apart would be suitable to cater for the spread to mature size and will make an attractive and maintainable privacy screen. This is a very attractive bamboo with unusual culm colours that makes it suitable as an excellent solitary specimen plant in a lawn or edge of the garden. 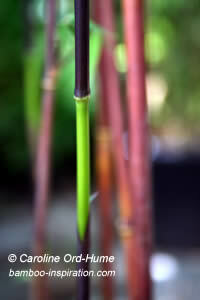 Fargesia nitida Jiuzhaigou bamboo is also suited to uses as privacy screening or hedging. Since 1986 several plant collectors have acquired F. nitida seedlings from China. The following are a few that are currently documented. Fargesia sp. Jiuzhaigou II (2) - this form is not so vivid in colour, leaves and culms are a bit bigger than 1. As new forms and mature plant characteristics become known through cultivation over time I'll add them to the list.